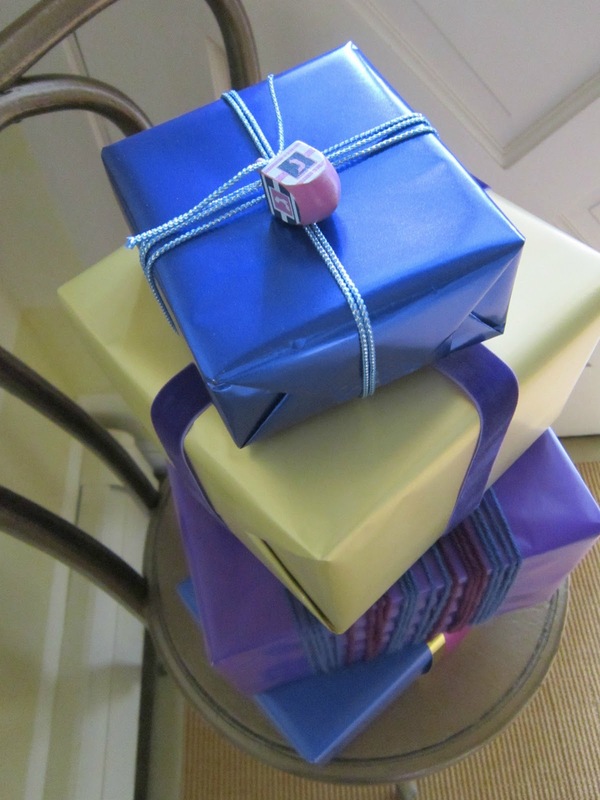 One of my favorite things about Chanukah are the endless possibilities of giftwrap. A few years ago, I decided to start giving my nieces and nephews gift cards instead of presents. After all, they were teenagers, and I thought they would rather choose their own present. I placed the gift card in an envelope along with a card and mailed it. When my niece Mia opened the card, instead of being happy, she was terribly disappointed--she always looked forward to seeing my beautiful wrapping and now all she had was a Hallmark envelope! Ever since that Chanukah, I place the gift cards in small boxes and wrap them just like I would regular gifts. I like to have a theme for gift wrapping--this year, I decided to go with jewel tones. 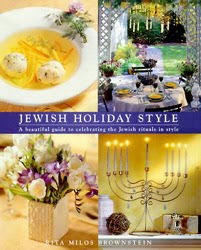 I think they capture the richness of Chanukah and they're much more interesting than the classic blue and white. 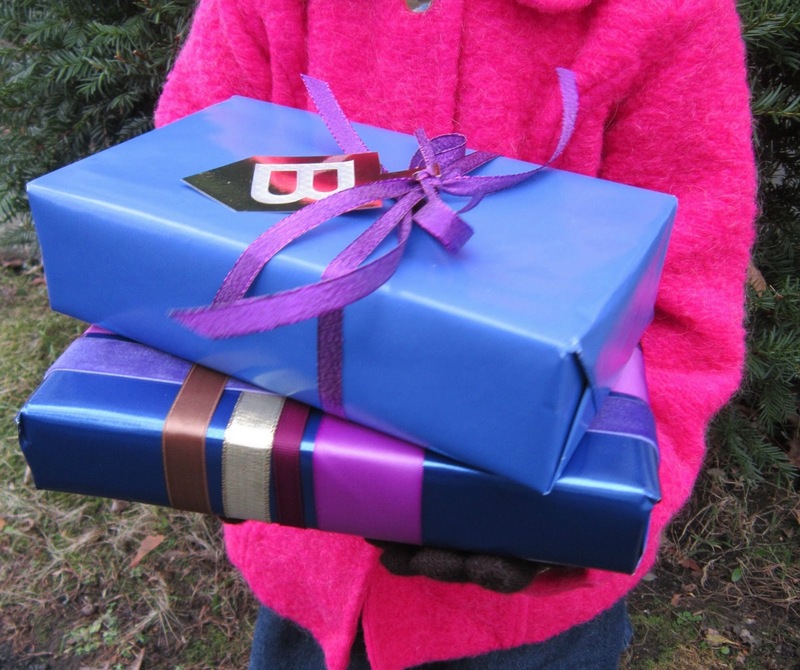 Here are eight easy gift wrap ideas for the eight nights of Chanukah. Left: Cut a simple dreidel shape out of gold card stock, then punch a hole in the top with a paper punch--tie it with some glittery purple ribbon. A silver letter sticker with the recipients initial makes it personal. 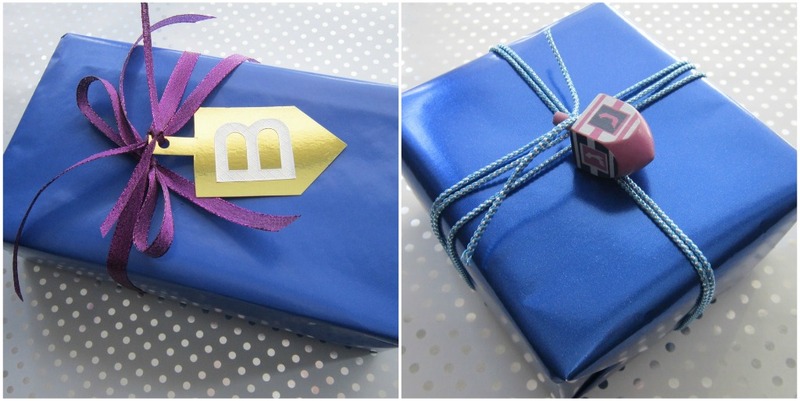 Right: Another option: use a real dreidel and tie it on the gift with blue and silver cording. Left: Chocolate candy "gelt" coins are soft enough to poke a hole through with a wood skewer and are easy to incorporate into gift packages. 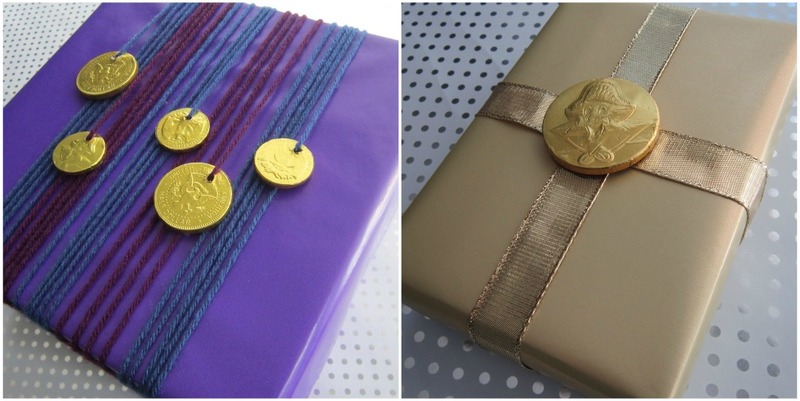 Colorful yarn is wrapped around the package and looped through the holes in the coins. The yarn is a nice surprise from the usual ribbon. Right: A large chocolate "gelt" coin is adhered onto a simple gold-on-gold package with double sided tape. 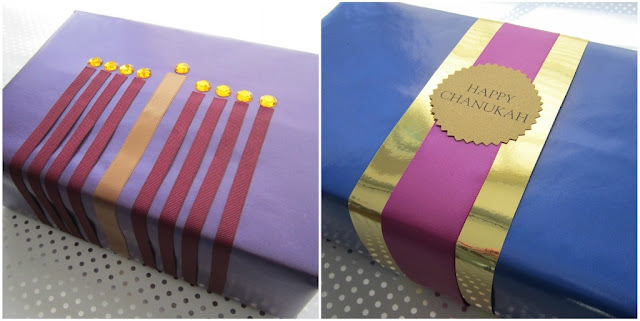 Left: Wrap ribbons halfway around a package to create "candles" for your menorah. (neatly tape the bottom to hold in place). 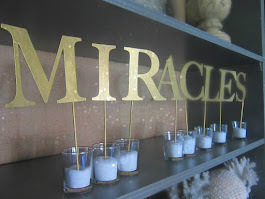 Colored gems from the craft store glued to the tops give the illusion of a flame. 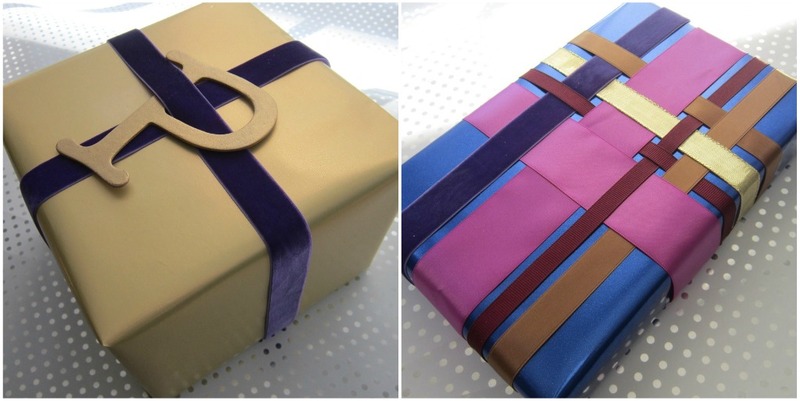 Right: Gold metallic paper is wrapped around the box, then layered with a silk purple ribbon. For the seal, print out "Happy Chanukah" on colored paper, then cut out in any shape you'd like using sewing pinking shears. Left: The chipboard letter was left over from another project, but you can find these at most craft stores. I painted mine gold and weaved it through a purple velvet ribbon. Right: If you ever made woven potholders as a child you will find this wrapping technique isn't that different. 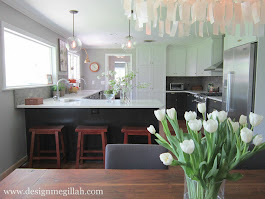 Just weave your horizontal ribbons in and out of the vertical until you are happy with your design. These are just wonderful I love everyone of them thanks for sharing your ideas with us. So happy to meet you I have enjoyed looking around. I have just found your lovely blog through the blog on Christmas cheer link wonderful to join in. I'm now following you hope you visit me sometime, follow back if you like so nice to find new friends to catch up with. Have a great day. I really like the design of these! My favorites are the gifts with gelt and the gifts with wrapping ribbon. 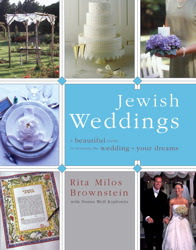 I pinned this post on my Hanukkah Pinterest board!